Figuring out how to choose a web hosting provider is not a simple task. Every business should have a website, even if it’s just a simple branded splash page with a contact form to help people know you’re legit. But for many small business owners, freelancers or entrepreneurs, the process of creating a basic web presence can be daunting. There are many variables to consider and making the wrong choice could cause your customers headaches and cost you more down the road. At Turkey Burg, we want to help you make a sound decision for your all website management needs. 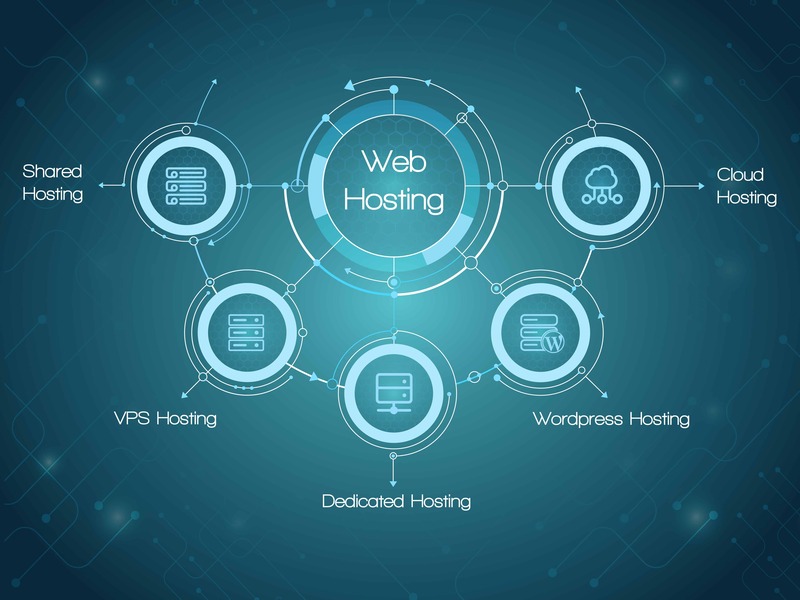 This guide focuses specifically on factors to consider when selecting a web hosting provider. It covers the following topics. The first step in creating a website is registering a domain name and finding a service to host it. While these initial requirements can be completed with a single supplier, we recommend using two vendors to keep your domain registrar separate from your hosting provider. It may seem cheaper and easier to keep everything under one vendor, but splitting suppliers will give you more control and platform redundancy. A registered domain can point to any external hosting plan by creating an A record or configuring the nameserver (NS) records in your domain name system (DNS) settings. The DNS translates domain names into IP addresses and controls email delivery. This interface will look different depending on the hosting provider but fields should stay the same. The biggest advantage to keeping your domain name separate from your hosting provider is the ability to change hosting providers without moving registrars, which can be a more involved process given the WHOIS protocol that governs domain registration in most countries. Any type of downtime scenario needs a swift remedy. Having an extra layer of separation is a real advantage when you need to reconfigure your DNS settings. This could happen if your current provider experiences server issues, your account becomes compromised, or the terms of your service agreement change. You might be overwhelmed with the number of web hosting providers to choose from. However, it’s not the best idea to select a hosting service based solely on its name recognition, flashy advertising or pricing structure. While all hosting providers look similar, you must watch out for important differences. Let’s explore server infrastructure options to start. The server infrastructure is the first element that you should consider when you create a website. You could build your own infrastructure, but most small businesses don’t need to. Web hosting providers have various server infrastructure options, and you can choose one of them depending on your needs. Shared server hosting is an infrastructure that allows a web host to house multiple sites on one server. For instance, a single server may host Site 1, 2, 3, 4 and 5 along with yours. This option is ideal if your business has modest needs and a small budget. It’s the cheapest choice because each site pays for space on the server. Some shared server hosting services are less than $10 a month. The downside is that the performance of your site will depend on how the other sites on the server perform. Since several websites run on the same pool of CPU resources, a significant traffic spike on Site 2 could impact how your website and the others perform. The pages could load slowly or not at all. Using shared hosting can also restrict your access to uploading files. It may prevent shell access, limit how much database access that your site has and confine you to only using certain programs. Not all shared server hosts implement the same permissions and restrictions. A lot of them even offer a range of plans with different levels of service. In general, the more permissions and programs that you can access, the more expensive that the service becomes. Virtual private server (VPS) hosting is like shared server hosting because it houses more than one website on the same server. The difference is that a VPS offers more power than a standard shared server and hosts fewer sites. It also has more flexibility and stability. As a middle-tier service, VPS hosting combines the benefits of a dedicated server with the cheaper price of a shared server. For example, a VPS may only house three or four sites rather than six or seven. This is what allows for better performance like a dedicated server. Also, each site owner still pays for space on the server. Because of that, most hosting providers charge about $20 to $60 a month for their services. However, you might need knowledge of basic server management and maintenance to use VPS. Compared to shared and VPS services, dedicated server hosting is more powerful and costly. Instead of hosting multiple websites, a single server is dedicated to one. Then, that site doesn’t have to share the RAM or data limits with other websites. Because your site can leverage all the resources, dedicated hosting offers great reliability and stability. It also allows you to install your own scripts if you so choose. Another benefit is that you get a dedicated IP address, which is the real address for your website. The domain name that you choose simply makes the website address easier for customers to remember than a series of numbers. On a shared server, though, the IP address may be shared among the sites on that server. If one site uses the shared IP causes the IP address to be censored in another country or blacklisted by search engines for spammy behaviour, the censorship will block all the sites using that IP address. Being on a dedicated server with a dedicated IP address avoids this problem. The downside is the higher cost. It’s often hundreds of dollars per month to have a dedicated server. In addition, you may be responsible for handling some technical issues depending on your web host’s services. Some providers also sell dedicated IP addresses as an add-on to shared hosting plans. WordPress is the most popular content management system on the web. You might only know it as a platform that bloggers use, but it offers so much more. A vast selection of free and premium website themes and plugins is its foundation. Aside from bloggers and small businesses, major brands such as Disney use WordPress through a hosting provider. WordPress hosting is different from a WordPress-powered website. Providers offer optimized or managed services for the site. In either case, the CMS is preinstalled unlike a standard web hosting environment. You don’t have to download or set up a WordPress installation. Most hosts also handle the technical elements such as updating the CMS and applications or enabling backups. This can cost about the same as shared server hosting. Managed services provide additional customer support. They’re also likely to offer staging site services so that you can preview pages or posts before they go live. Enhanced security with malware detection and removal may be included too. Of course, the more services that you get, the more expensive that your web hosting will be. Managed WordPress services can reach $30 or more per month. Also, be sure to check for any restrictions of the managed hosting plan as some providers may limit plugin selection and not provide Control Panel (cPanel) access. With shared, VPS and dedicated servers, your website relies on the resources of one server. With cloud server hosting, though, your site can use resources from multiple servers. The advantage is that if a website has a sudden spike in traffic, it can use resources from another server to maintain performance. This prevents slowly loading pages and downtime. There are two types of cloud hosting. Some web hosting providers offer solutions for small businesses. These are like shared and VPS services. Others are giant clouds such as Microsoft Azure and Amazon Web Services. These are much larger and often more expensive services. A CDN is an infrastructure of distributed servers that delivers web pages to internet users based on their locations and the server locations. This feature is effective for improving page load speeds for websites that attract global audiences. The closer that the users and CDN servers are to each other, the faster that the web pages will load. CDNs are good for spikes in website traffic and they can reduce latency, bandwidth consumption and block spammers. Many organizations use CDNs for e-commerce transactions and to deliver content to consumers, including games and videos. For most small businesses, the physical location of your web server won’t matter much. However, there are some cases where companies may need to consider where their data is stored and/or the local privacy laws governing the location. A common situation would be where business regulations require your data to reside in your home country. If your web host store your data in the cloud or in a different country, you may need to find a different hosting supplier. This wouldn’t apply to cloud hosting plans or if you’re using a CDN, but many hosting providers offer a choice of data center locations. For example, you may elect to have your data stored on a server in Europe instead of the United States. 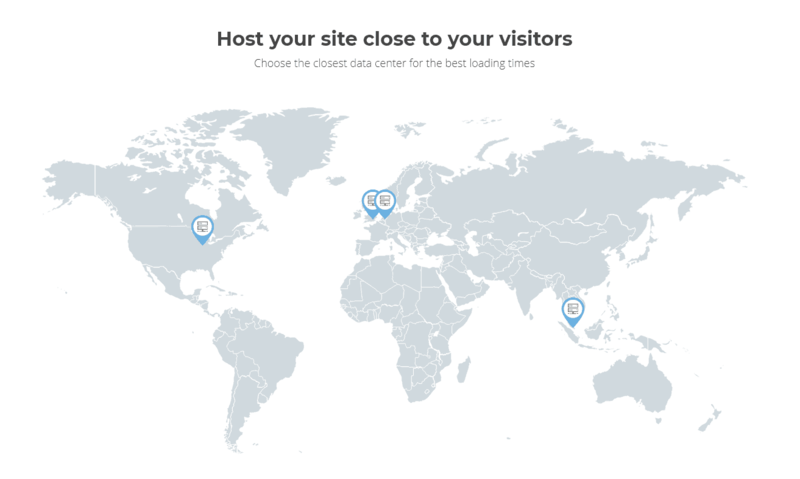 SiteGround offers customers a choice of four server locations on three continents. All servers run on operating systems. This software is the layer on which other apps can operate on the server hardware. It enables and facilitates functions such as database, file, mail and print services. It’s important for you to consider the operating system that a web host uses on its servers. For instance, some apps that you use might require Windows such as Windows Server 2000 and Windows Server 2008. On the other hand, you might need a Mac OS X Server for your apps. In many cases, a variant of Linux, such as SUSE Linux Enterprise Server or Red Hat Enterprise Linux, will work for business websites. A lot of web hosts offer simplified cPanels for Linux servers to make website management and server administration easier. It could be cheaper to use a Linux server than a Windows server too. You can narrow your web host options with a list of the features and add-ons that your website and server need. We already mentioned the option to add a dedicated IP address, but there are many other upsells to consider. An e-commerce site, for example, needs plenty of disk space, processing power, RAM and bandwidth to perform well for customers. Bandwidth is the measure of how many bytes that your customers use during a certain period. Low traffic uses low bandwidth, and high traffic uses more. Be honest with yourself about the number of customers that you expect to determine your bandwidth needs. If your business is young, you could start with low bandwidth limits. Just make sure that you can upgrade to higher limits as your site traffic increases. One must-have feature for any business website is email. It’s the most convenient way for you to communicate with and market to loyal and potential customers. Consider whether you need just one account for yourself or several email accounts for employees. Most web hosting providers offer various options from paid email packages to unlimited accounts with aggregated data limits. Most companies rely heavily on email and purchase email hosting separate from your server hosting. Microsoft 365 and Gmail for Business (GSuite) are common examples of business email packages that also include cloud file storage and a variety of office applications. As with separating your domain registrar from your hosting provider, keeping your email and file storage away from your web hosting will let you communicate with customers if your web server goes offline. The ability to back up your apps, databases and files is also essential. If your website is hacked, corrupted after an update or loses critical files, a backup will be your saving grace. It allows you or your web host to restore your site on the server. If it fits with your business model, consider looking for affiliate programs as well. These offer commissions for referrals to web hosting services (disclosure: Turkey Burg has an affiliate account with SiteGround). They may also provide marketing materials, assistance and real-time tracking. Server uptime and web page load speed have an impact on the overall revenue that you earn from your website. Uptime refers to how long your server and website are live. Selecting a web host with great uptime ensures that your website stays up and running as much as possible. Load time, or page speed, is another important consideration. While many factors can influence page speed, server response time is a major one. Let’s face it, people aren’t patient when they visit websites. They want access to what they need. Fast. In fact, many website visitors don’t like to wait longer than three seconds when they browse on mobile devices. According to studies, mobile browsing is more popular than desktop browsing. If your web pages have long load times, then you could lose those customers or applicants. With a business website, security is a major concern for yourself and your customers. Your web hosting provider should offer anti-malware and anti-spam tools. Network monitoring can halt the spread of malware and spam from server to server. Scanning the files on your account can prevent viruses from spreading too. It’s also convenient for your web host to remove these website security issues. If you’ll be transferring sensitive data in any way on your website, you need a secure sockets layer or SSL certificate. Its purpose is to encrypt and secure the communication between your customers and the server. With an SSL certificate, you secure your customers’ personal information, a must for any website that processes credit card information. Web application firewalls add another layer of security by monitoring the traffic that moves between apps. Some web hosting providers also prevent distributed denial-of-service attacks. These occur when attackers send overwhelming amounts of traffic to your site so that your real customers can’t use it. Advanced services and tools from your web host can keep your site safe. If your website is important to your business, you need more than basic customer support from web hosting provider. You need quick response times and solutions when you experience technical errors or a cyber-attack. Make sure that your web host is available 24/7 through numerous channels such as live chat, phone, email, forums and even social media. For optimal service, the company that you choose should have an in-house support department rather than use an outsourced service. When you research web hosts, also look at customer service reviews before signing up. Reading other businesses’ experiences can provide insight into which web hosts prioritize customer service. Do you still have questions about selecting a web hosting provider? We can answer your questions and even provide a variety of website management and development services. We recognize that every business has specific needs and work with several hosting providers and registrars, depending on client requirements. Contact us today to learn more about our full-service marketing communications consultancy.